It's so nice to be with Troy on the bus ride to the start...even with all the rain. The girls are back at the hotel with Nana Sue (Troy's mom) and Papa Ray. It's so nice of them to give us have this opportunity to race together! 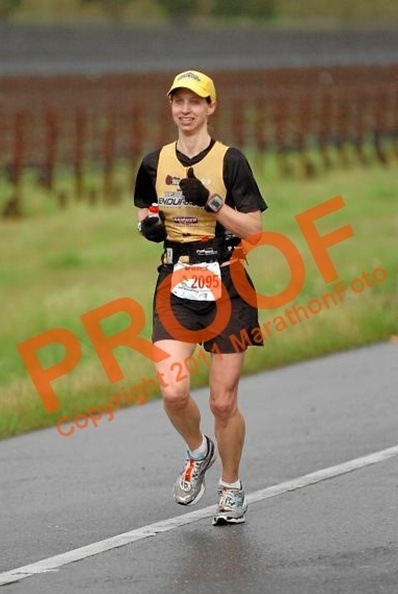 This is our 2nd Napa Marathon that we have raced together. If we both finish, we’ll each have 4 Napa's under our belts! Troy hasn't done any kind of race since October. It's so nice to see him able to start this one! I hope his body will hold up and he'll complete it...even if it means walking. It's been a tough year; full of injuries, sickness and too many push-ups! 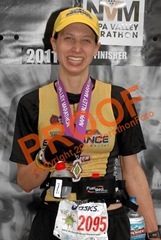 I hope to run under 3:18 (7:33 pace). 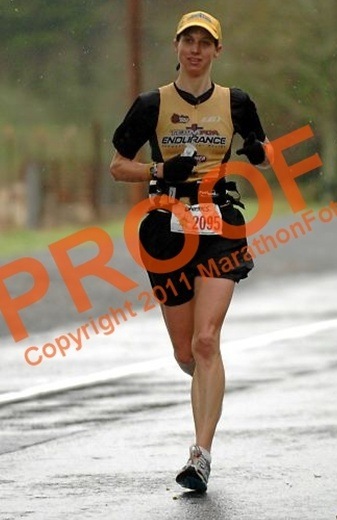 Our friend Dave Campbell challenged me to beat his CIM time and I'm going for it! Today we’ll have rain and a slight headwind but we know that the Lord is in control and the outcome is His will. Let’s see what happens! I have two more goals today. 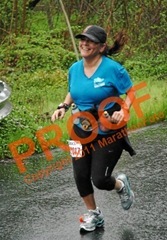 I want to smile the entire race whether I'm feeling great or not. The Lord is my joy and strength so I have no reason not to! I also plan on praying for someone in my life each mile. There are others struggling in health, marriages, jobs, and other personal issues. I want to take the focus off myself and put it on them. Christ has the power to help me today and I know He can help them, too! I've been fasting from caffeine (including chocolate) for the last month so that I can really feel it's effects today. It's been a long wait but worth it. I'm carrying a flask of flat Coke for the last 6 miles where I’ll need a serious boost. I also have my Espresso Hammer gels to look forward to! Troy and I warm up and do some stretching. We run into Eric Gilsenan and friends. He's going to be on the course riding his bike. Eric tells his friends that Troy donated a kidney and they are very touched. I forget sometimes that he only has one kidney. I love my one-kidney-wonder! We drop off our race gear and now are sporting our light blue recycle bags. We run into Mary and all pray and put our focus in the right place. We take a quick group picture before the race starts. Then we find a good starting place. Troy and I will run part of the first mile together and then part ways. I tell him that I love him and I'll be looking forward to hearing how his progress goes! Ready, set, go! We take off! It's bunched up and I have to dodge a few folks to get moving. I love running with Troy even if it's only a few minutes. We take it all in together and then Troy tells me it's time for me to go. I continue to look over my shoulder and wave. "Have a great day!". Mile 1 is 7:32. Right on pace! So far it feels comfortable and I hope that continues. Here come the rolling hills. I remember to keep the same effort...thanks Carrie Chavez for the reminder! I'll try to capitalize on the free speed on the downhill. Mile 2 is 7:40. No worries! I'll continue to work to make up the time on the downhills. I'm getting a little warm in my blue bag but I'm not ready to ditch it yet in this steady rain. I tear it a bit to get some air. Ah, that's good! Mile 3 is 7:31. That's better! And now I get to enjoy a bit of a downhill. Mile 4 is 7:25. Great! More time in the bank! I finish off my Heed flask. Mile 5 is 7:31. If I can just keep it steady here. Here comes another climb. Relax and don't push too hard. Mile 6 is 7:38. I expected that and I'm not worried. I'm reminded to look to Jesus...He's got a great plan! Ah, downhill, move it! Mile 7 is 7:32. I was hoping for a significant boost on that downhill but I'll take it. I notice a couple of spectators out of the corner of my eye and think nothing of it until I hear "Go Robin". It's friends, Leonie and Rich Alesci! I'm totally surprised and touched! "You look great! Good job!" I thank them for coming out and that it's made my day...so much so it makes me want to cry! They were there at my last big effort in Kona in '07. This really means a lot! Mile 8 is 7:28. The Alesci boost really carried me a long way! I'm feeling great from the inside out even though it was a bit of an uphill. Mile 9 is 7:27. Good! I decide to ditch the blue bag. The rain is slowing and it almost looks like the sun might pop through. Mile 10 is 7:33. Good! Thanks God! Mile 11 is 7:32. Even with a slight uphill, I'm glad that I could hold the pace. I'm climbing again. I tuck in behind a few guys that pass by talking about Ironman. Sounds like a good crowd to hang with! I haven't yet focused on other runners but it will be good now to help stay focused! Mile 12 is 7:39. I'm looking forward to the Espresso Hammer gel! I'm hopeful that at the half marathon I'll be on 1:39 pace. Mile 13 is 7:36. 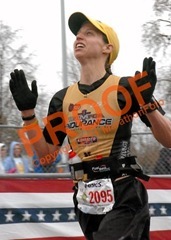 And I pass the 13.1 mile mark at 1:39. Good! Now it's all about maintaining! Ugh, another hill! It's in your hands Jesus! I relax and continue to smile. I take in my gel and wait for the caffeine to start kicking in. Mile 14 is 7:52. I expected that. Here's a bit of a downhill. 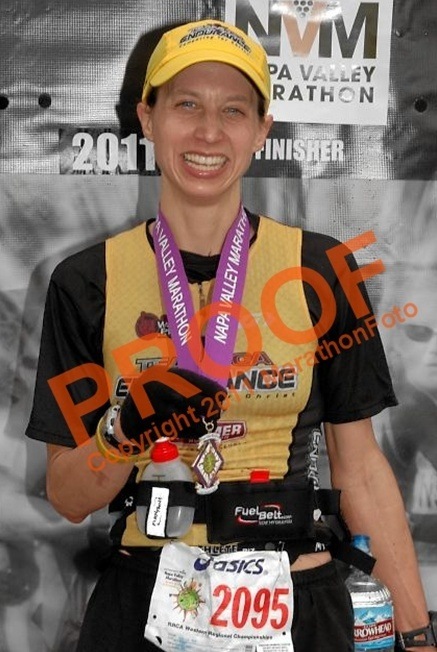 One of the two Ironman guys has faded so I latch onto the other one. I'm starting to pay attention to the girls ahead of me. I see a group of 3 and another girl beyond that. I’m trying to close the gap. There's Rich and Leonie! Yeah! "Go Robin, you look good!" Again, a big boost! They are also encouraging the others around me. They are awesome! Mile 15 is 7:31. Better! I pass the Ironman guy as I aim for the girls ahead. I'm climbing again and the rain is back...two things that could get me down but not with Christ! The girls and Nana Sue and Papa Ray should be at the next mile at 9am. It will be great to see them! Mile 16 is 7:51. I make it by 9am like Troy projected but there are no girls. Sigh! Well, I know they'll be here for Daddy and it will be great for him to have the support! I hope he can keep going! Okay, now it's focus time! I catch a girl in blue and a few guys. Mile 17 is 7:38. The Ironman catches back up with me. The road has flattened out and I can see clearly ahead. Mile 18 is 7:28. Good, I feel like I'm getting back on pace and I hope once I start taking in the Coke after 20 that I'll be able to really push it home! I'm starting to notice the headwind now. There are few people around me to tuck behind. A speedy looking guy goes by and I decide to hang with him. He's running in the middle of the road and I get the feeling he doesn't want someone on his shoulder. I continue along next to him and use others we pass for cover. Mile 19 is 7:30. I'm looking forward to wrapping this up! Though I'm approaching that group of 3 girls, the blue girl catches me. I'm still following the speedy guy. We are climbing again slightly. Mile 20 is 7:47. I'm moving past more people including the 3 girls. This is considered "the wall" of the race but I don't feel like I've hit it. The blue girl and I keep trading off leading. She's walking the aid stations so I hope to take advantage there. Mile 21 is 7:34. Time for a real caffeine boost. I take out the Coke and start sipping it! I want to catch the girl I've been watching from afar. I hope to do it before we turn off the Silverado trail! Mile 22 is 7:36. Come on Coke! I feel it coursing through my body but it's yet to make it to the legs. We turn off Silverado trail and there's Leonie and Rich. "Go Robin! Negative split those last miles!" It sounds doable with the energy I'm feeling but my legs are the question; especially my quads. I tell them thanks as I try to push and look for that girl. Another girl next to me gives me a high five and tells me to go for it...so nice! Mile 23 is 7:40. Eric Gilsenan comes alongside on his bike and offers me a gel and water. I thank him and tell him I'm good and finish off my Coke. Come on legs! I notice a young girl run by the opposite direction. Mile 24 is 7:42. My quads are feeling as if they are going to cease up. I've never felt that! The young girl comes by with her mom in blue! Wow, that's neat! They fly by and I try to react! My legs just cannot do it. I just got to keep them going. Lord, I know that you're in control! Mile 25 is 8:01. Ouch! 3:18 is definitely out the door! It's all about survival now! I'm not angry or bitter. I know that this is the Lord's perfect plan! I just keep on smiling. 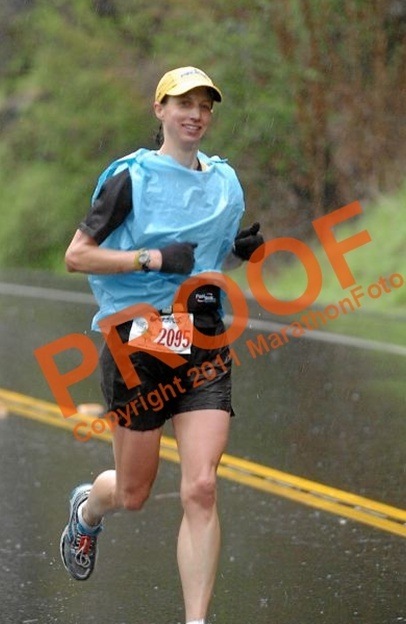 Mile 26 is 8:23. The girl that high 5ed me goes by and I tell her good job. The finish is coming! I can soon stop! My legs feel like heavy weights and they don't have much left in them! I can see the finish and 3:21 on the clock. 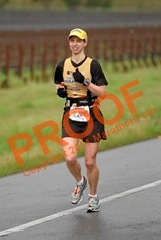 With a smile on my face, I keep pushing as best as I can and cross at 3:22:01. I'm done! Thank you Lord! That is a personal best and a Boston Marathon qualifier...BQ20...20 minutes under the standard qualifying time for my age group. Thanks be to Jesus!